Successfully managing the patient with chronic hepatitis C (CHC) can be a challenge to the physician. Not only does the patient with CHC impose a specific problem with therapy, but in addition the therapy itself is complex, and is associated with a multitude of side effects. This chapter examines strategies for the management of side effects in patients treated with both interferon (IFN) and IFN—ribavirin combination therapy. In the clinical trial scenario, approx 90% of patients can complete 6 mo of therapy with IFN and ribavirin, and 80% can complete a full 48 wk course of treatment (1,2). This excellent level of compliance should be achievable in the office setting. Understanding and recognizing the side effects associated with IFN—ribavirin therapy will help the clinician in educating the patient and family about the optimal strategies for successful therapy of CHC. 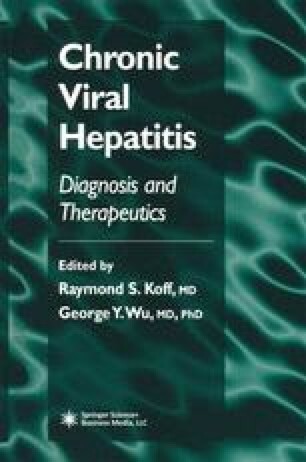 Although this chapter focuses predominantly on IFN-based therapy, it also briefly discusses some of the newer treatments for hepatitis C virus (HCV), including pegylated IFNs.